Deacons Today: Musings on Diakonia and Diaconate: Sacraments and Shopping: Here's an interesting idea. . .
Sacraments and Shopping: Here's an interesting idea. . .
CATANZARO, Italy, SEPT. 22, 2010 (Zenit.org).- Shoppers at the Le Fontane shopping center in Catanzaro are now finding it easier than ever to attend Mass on Sunday: a new church in the area gives both consumers and employees an effortless way to find a Sunday Mass. Archbishop Antonio Ciliberti of Catanzaro-Squillace presided this month over the solemn dedication of the new parish complex, named after St. Maximillian Maria Kolbe. 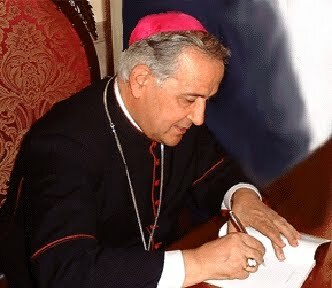 "People for whom it has become a habit -- and, unfortunately, they are increasingly numerous in the context of our consumerist pseudo-civilization -- to spend Sunday afternoon in these shopping centers, now find the opportune possibility of being able to enjoy the wealth of spiritual values," Archbishop Ciliberti noted on Vatican Radio. Every day some 10,000 people visit this 20-hectare (49-acre) shopping center. However, the prelate pointed out that St. Maximillian Kolbe is not just for these consumers, but above all stands to benefit the near 1,800 residents of the region, who did not previously have a parish. "Our task is to go beyond the boundaries of ordinary pastoral care," the 75-year-old archbishop said, adding that his intent is a ministry program that is "radically innovative." Two Masses will be offered at the church on Sundays and one on weekdays. Not only is the idea itself interesting. I found the Archbishop's talk of going "beyond the boundaries of ordinary pastoral care" and that he intends a ministry that is "radically innovative" to be rather exciting. In one of my first posts on this blog, I mentioned that deacons serve in a "servant Church": a Church that, as Pope Paul VI put it, was to be "servant to humanity." What do you all think? Is this a good example of the kind of outreach ministry that might be attempted elsewhere? Having a chapel in a shopping center is a great idea. In fact, the North Shore Shopping Center in Peabody, Ma. has had one since about the late 1950's. It was recently renovated and Cardinal O'Malley came to bless it. It is run by the Carmelites. In Boston, in the shopping center at the base of the Prudential Tower, is another chapel--run by the Oblates, I believe. there for decades going back to when there were mostly factories and warehouses in the area when it picked up the nickname: The Worker's Shrine. So maybe the rest of the country will someday catch up to the Boston area. Pope: "Have a care also for your deacons. . . ."
What difference does the Mass make? Deacons: Ordained to. . . WHAT? A little housekeeping. . . .